The SAH Series Horn Speaker powered horn loudspeaker employs digital switching amplifier technology resulting in low DC current draw and low heat dissipation. 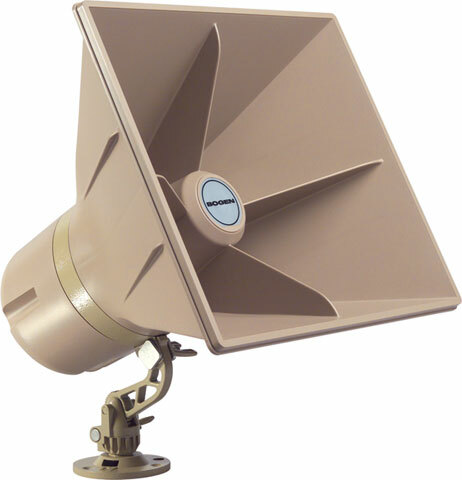 This means fewer power supplies, longer cable runs, and the capacity to work at higher ambient temperatures when compared to conventional analog self amplified horn speakers. The horn loudspeaker can be positioned in any orientation (rotate, tilt, or swivel).The shape of the horn flare provides a controlled dispersion of sound for better intelligibility. The SAH Series Horn Speaker can be used in any environment, indoors or outdoors, without affecting sound quality. Two-Year Warranty standard.